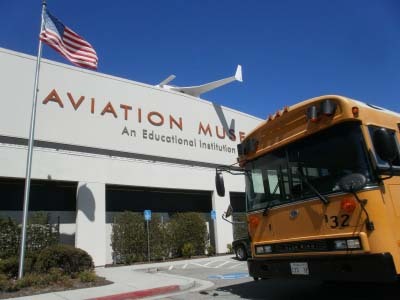 Enhance the Hiller Aviation Museum experience for your students by scheduling a hands-on program as part of your visit. A variety of programs are available for different grade levels and include model aircraft, aviation weather, aerodynamics labs and flight simulation in the Flight Sim Zone. Programs last 50 minutes (90 minutes for Extended Programs) and require a program fee in addition to Museum admission. This is an exciting, excellent program that gives students a vision for what they could possibly do in their futures, plus gives them fresh appreciation for the science of flight. All programs are aligned with California State Content Standards in science or math and are intended to be completed in conjunction with a guided tour. The Aerodynamics Tour is strongly recommended for junior high groups participating in a Forces of Flight program. 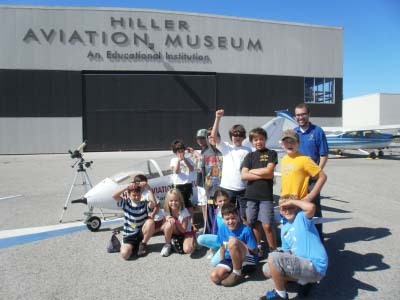 The Hiller Aviation Museum’s annual celebration of engineering, the Aero Design Challenge provides middle school students with an immersive, hands-on experience in flight. Students are introduced to the Engineering Design Process, experience four different discovery stations focused on vertical flight, then work in groups of 3-4 to build, test and improve a paper helicopter! Aero Design Challenge is available at no charge through the generosity of the Miranda Lux Foundation, SAP, and Raley’s. Availability is limited and a 50-student minimum group size applies. Investigate more areas of airline transport operations! Includes dispatch, weather and ATC activities from Airline Operations I plus a challenging flight simulation to land a Boeing 737 airliner at the chosen destination airport. Our most popular hands-on program! Learn the different kinds of aircraft and identify the parts of an airplane before building and flying a simple balsa glider. Grades 4-5 add control surfaces to guide their glider’s flight. It ’s an adventure in aviation! Take flight with a rubber-powered airplane! Recommended for older students, Amazing Aircraft II features construction and flight of a larger, propeller powered balsa airplane. Grades 4-8 add control surfaces to guide their airplane’s flight. Launch into the amazing world of aircraft! Discover the uses of Computer Aided Design and use a simple CAD program to create a personalized Hiller Aviation Museum namesake. Observe additive manufacturing and print original CAD designs on working 3D printers! Investigate the dynamic world of robotic flight! Observe a drone flight demonstration in the Museum’s Drone Plex, complete electric circuits to power motors on a model multirotor aircraft, and fly a realistic quadcopter simulator. Discover the history of Wilbur and Orville Wright and their unprecedented scientific adventure to invent the world’s first airplane. Examine a full-scale recreation of their 1903 Flyer and build a beautifully detailed flying model to help take the excitement of the first flight home. How do the forces of flight affect a glider? Children conduct an inquiry-based investigation into lift, weight, thrust and drag and conduct an experiment to discover how changes to an aircraft wing affect performance. All participants keep a small balsa glider. Science, math and aviation come together in a three-part experience! 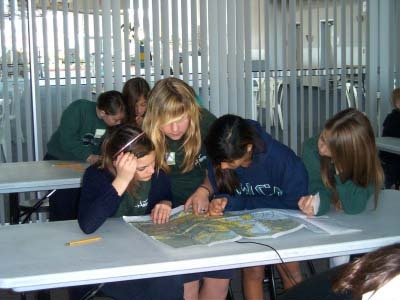 Students inspect a small aircraft, use aviation charts to plan a flight between airports, and fly a portion of the planned flight in the Flight Sim Zone. Careful consideration of terrain contours and calculations of fuel consumption and velocity are essential to ensure a safe mission. 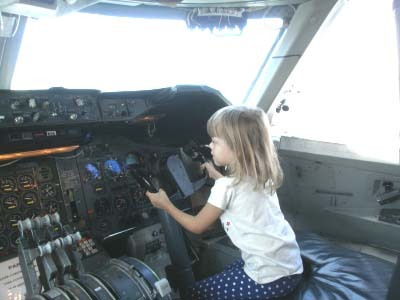 Enter the Museum’s Flight Sim Zone, where every student has the opportunity to control a simulated airplane through several realistic, age-appropriate missions. Using state-of-the-art flight simulation equipment and software, students work in pairs to master aircraft control while flying through a beautiful reproduction of the Bay Area and other locations worldwide. Combine flight simulation and glider construction to explore aviation from every angle! Students conduct a hands-on inspection of a real airplane, build a flying model glider and try their hand flying a small airplane in the Flight Sim Zone. It’s an all-inclusive aviation experience! Explore the world of weather! Discover the water cycle’s role in cloud formation and identify the cloud types that impact aviation. Construct a model of the water cycle and a cloud identification card. Take flight under the stars in a spectacular hands-on exploration of the sky! Identify stars, planets, constellations and directions under the arch of the Starlab dome. Take the controls of a small airplane in the flight simulators to master basic aircraft control, then take on the challenge of navigating to a successful landing under simulated nighttime conditions. Take an adventure into the night-time sky! Students enter a giant inflatable Starlab dome to explore by day the stars, planets and constellations that will be visible in the sky that night and discover the means by which early navigators found directions and plotted their courses by the stars. Explore how weather affects flight in a challenging foul-weather flight simulation. Discover thunderstorms and other weather hazards and how they affect aircraft, and then enter the Flight Sim Zone to embark on a realistic mission into inclement conditions. It’s a thrilling adventure to the edge of aviation!